Check out whats new in free No Man’s Sky update 1.13 Atlas Rises. 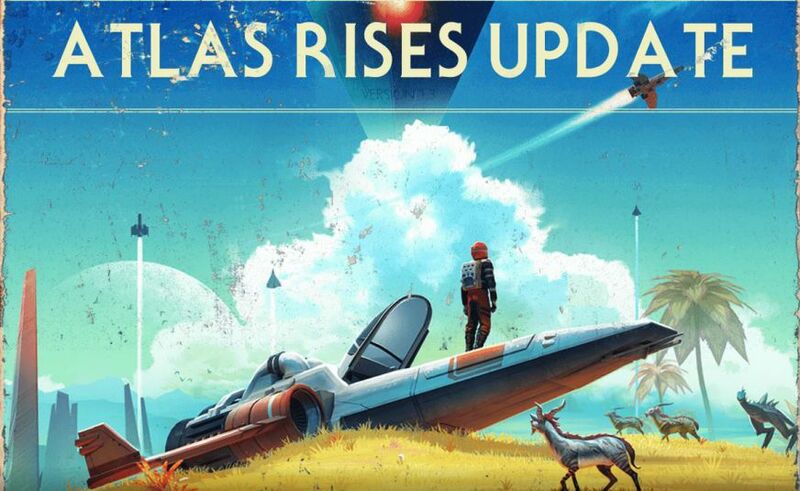 Hello Games has announced it is new free No Man’s Sky update 1.13 Atlas Rises. The is the biggest update for No Man’s Sky yet. The new Atlas Rises update brings a new context, quest system and branching narrative to No Man’s Sky. In the Atlas Rises story, the fabric of existence is starting to falter. A mysterious new interdimensional race has appeared, and ancient portals have begun to open. Glitches in the simulation, visualized by strange floating orbs, allow players to see and communicate with up to 16 other travelers and explore the universe together. Check out full changelog below. Featuring a new central storyline players can discover more about the universe and themselves, as well as a wide array of new and improved features. Whether you’re a veteran interloper or completely new to the No Man’s Sky universe, there has never been a better time to start your journey. A mysterious new interdimensional race have appeared. Glitches are causing ancient portals to activate. Our story brings a new context, quest system and branching narrative to No Man’s Sky. No Man’s Sky update 1.13 Atlas Rises brings 30 hours of new story content. Double the lore and interactions of the existing game. After Waking Titan, Atlas Rises. A regenerated system adds wealth, economy and conflict levels to star systems. and providing access to key information. Install galactic technology to be able to filter the map by lifeform, wealth and economy. Improved waypointing, and navigation allows you to see your journey so far, from beginning to end. The variety and visual quality of planetary biomes has been improved. Explore rare new exotic planet types as you journey toward the galactic core. Discover and scavenge lost cargo from gigantic crashed Freighters on planetary surfaces. Use the terrain manipulator to excavate buried resources in the region. With No Man’s Sky update 1.13 Atlas Rises, Complete Salvage missions for Guild rewards. Visit the new Mission Agent in Space Stations to pick up unique and rewarding new tasks. Missions are constantly generated, and cater to all play styles (scanning, trading, combat and exploration). New NPC guilds have been introduced, each with standing and objectives. Build your standing with numerous NPC guilds and unlock more difficult, more rewarding missions. New economic variables bring new depth to trading between star systems. Star systems are now classed based on their economic strengths and weaknesses. A tiered crafting system allows increasingly valuable products to be crafted by combining harvestable materials. With No Man’s Sky update 1.13 Atlas Rises combine crafted products to create increasingly valuable items that can be sold on the Galactic Marketplace. New maintenance interactions have been introduced for all harvesting equipment, bringing more depth to farming, mnining and harvesting. Analysis Visors have been re-calibrated to show more information and offer better rewards for scanning. Analyse resources before harvesting for to gain alternative resources from mining. Scanning Flora and Fauna now yields increased rewards. Specialised analysis visor upgrades can be equipped to further improve effectiveness. 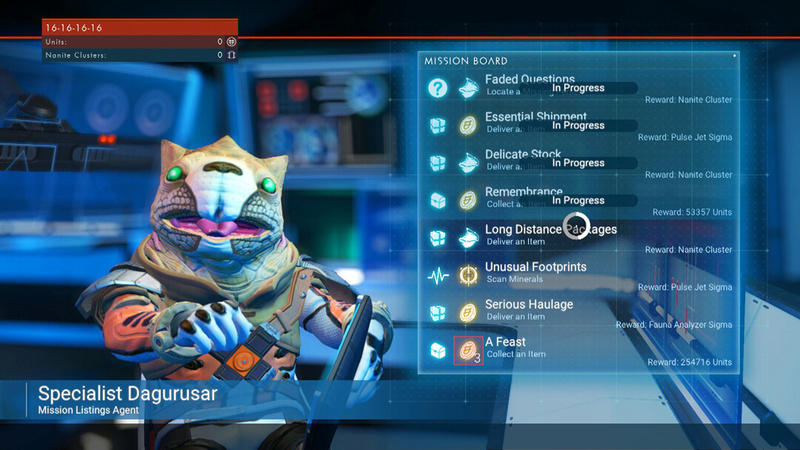 No Man’s Sky update 1.13 Atlas Rises brings a new mission log allows you to view your pending missions, and to decide which to track. The discovery page gives a clearer and visually improved view of your journey. An in-game guide has been added, offering numerous gameplay explanations and tips, for new and returning explorers. Journey milestone page has been updated to show progress toward guild specific milestones. Numerous environmental props and assets have been improved with high resolution textures, making environments seem more high fidelity. Transform the ground beneath your feet using the new terrain editing Multi-Tool enhancement. Add or remove terrain to mould the landscape as you see fit, anywhere on any planet. Choose from a number of materials, shapes and sizes to sculpt your unique creations. Form terrain around your base to make it feel like part of the environment. With No Man’s Sky update 1.13 Atlas Rises, Ancient portals can now be activated. Revisit previous planets, others bases or jump randomly to new worlds. Learn the language of portals by unlocking mysterious glyphsas you journey through the universe. Interact with a portal and input a specific combination of glyphs to quick travel to a specific planet. Share glyph combinations with the community to help others travel quickly to specific planets and points of interest. A number of improvements have been made to space flight and combat. Enemy artificial intelligence has been overhauled, and new difficulties have been added. Ship manoeuvrability has been improved, bringing more skill to dog-fighting. Devastating rockets can be equipped to ships and upgraded for even greater firepower. A new HUD has been introduced to improve the experience of space combat. This includes a communicator, which can be used to advance mission steps, or even to hail pirates before they attack. Atmospheric low flight assist now allows players to cruise above the terrain. Low flight and improved flight control make in-atmosphere dog fighting more likely and exciting. Warning: crashing into obstacles will cause damage to your ship. If your ship is destroyed, you’ll need to repair it before leaving the planet. Glitches in the simulation have begun to appear. Visualised by strange floating orbs, up to 16 players can see and communicate with one another, and explore the universe together. While interaction with others is currently very limited, this is an important first step into the world of synchronous co-op in No Man’s Sky. New Class S ship designs have been introduced and can be found roaming the galaxy. Interact with their owners to view, and offer to buy their ship. Wealthier systems have more expensive, higher class ships. Specific Technology and Cargo inventories have been added to improve inventory management. PlayStation 4 players can now adjust their field of view via the options menu in No Man’s Sky update 1.13 Atlas Rises. Jump between systems from the comfort of your Freighter. Just interact with the hologram on your bridge, and select a location to travel to. Landing your ship no longer auto-ejects you from the cockpit. Take time to survey the planet before exiting.